Today's treat looks impressive but is super simple to make. Galaxy Bark! 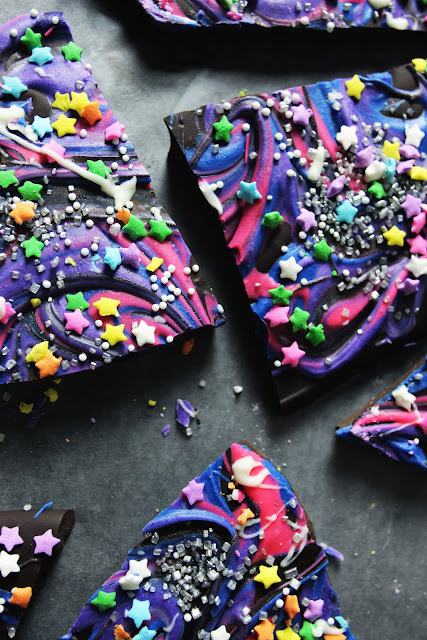 - a twist on the standard peppermint bark. 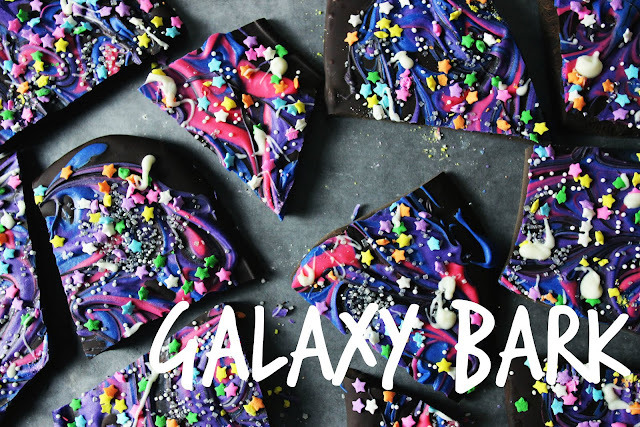 I'm so in love with galaxy prints on everything and this bark would be such a different and stunning addition to your holiday dessert table. Start with dark chocolate. 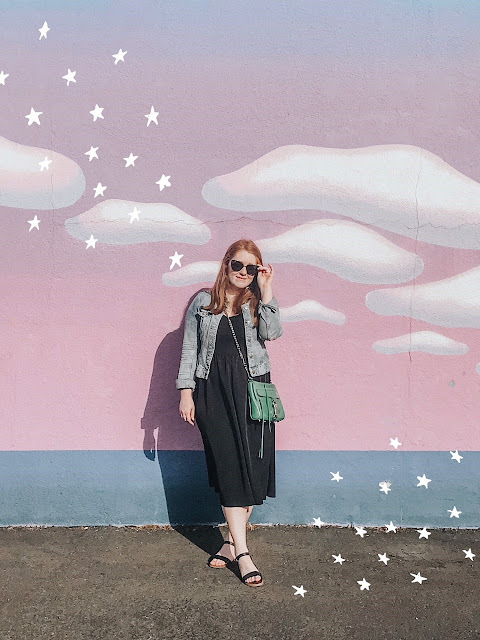 You can use milk if you want but dark is more in line with the night sky color scheme. Then melt white chocolate in three separate bowls and color with blue, purple, and pink food dye. 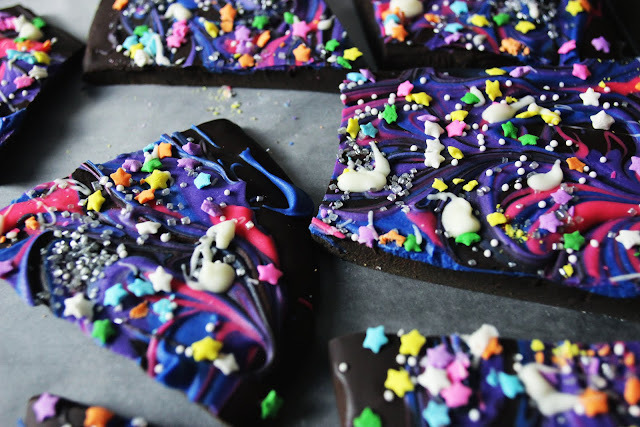 Pour the melted dark chocolate out onto wax paper and spread into a rectangle with a spatula. Then drizzle the colored chocolates on top and lightly swirl with a knife. The key is to not overmix - otherwise the whole thing turns into a gross blobby mess. 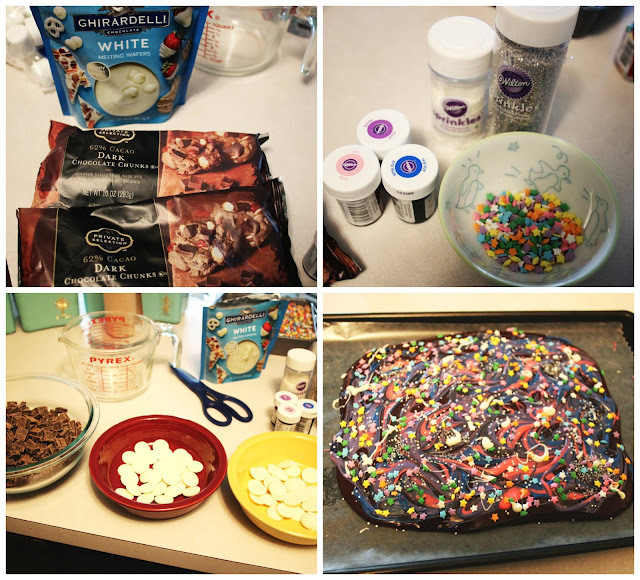 Once you've swirled the colored chocolate in, flick some white chocolate on top and add sprinkes. I went for silver sprinkles, white nonpareils, and colored stars. 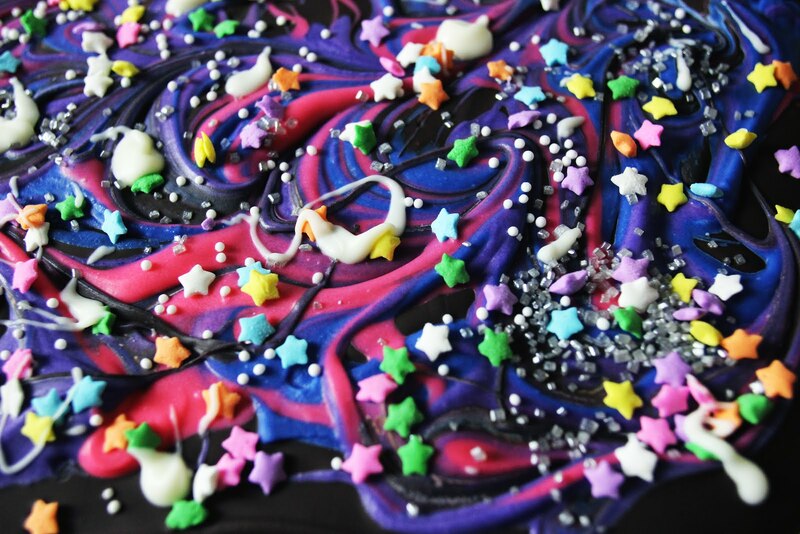 You could also do edible glitter, metallic or white stars - whatever you like! Pop it into the fridge for a few hours until hardened, then put a piece of wax or parchment paper on top and smash with a mallet to break into chunks. I did find that you have to hit it quite hard so make sure the counter you're working on can take a few hits. 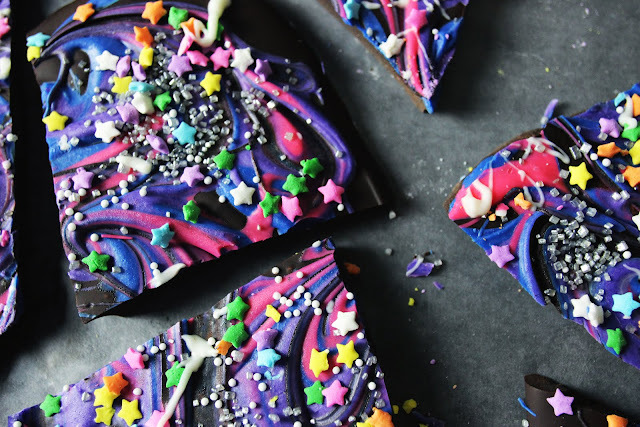 Don't be fooled by the bright colors, if you use dark enough chocolate as the base, these will be perfect for the dark chocolate lovers in your life. 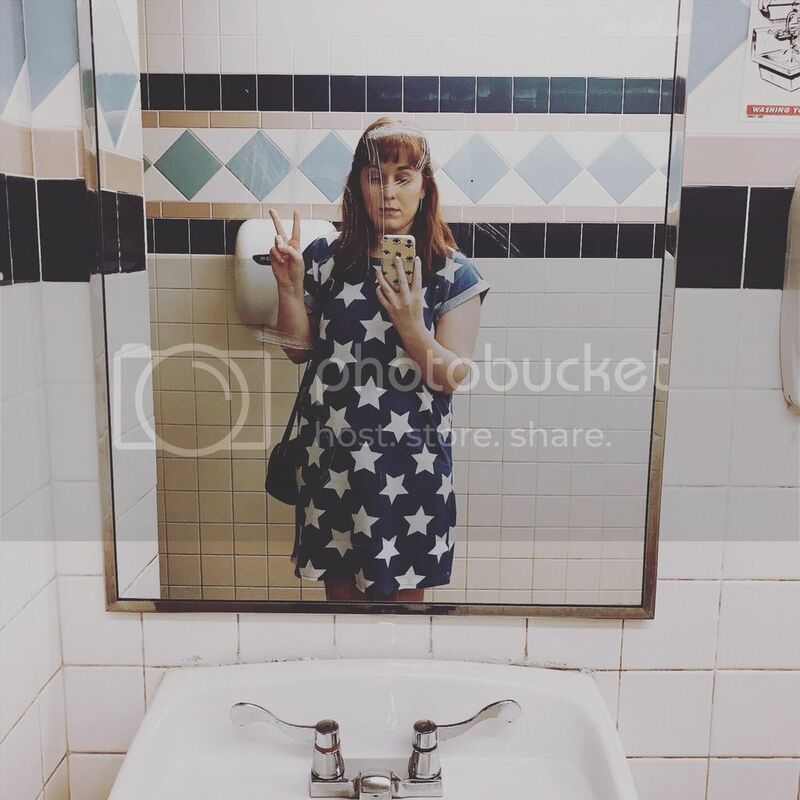 Look how beautiful this turned out! I'm just a little impressed with myself, haha! Hope you enjoyed this little recipe!